Owner of Almond Origin Jake Deleon, center, and team members at a natural foods trade show. Jake Deleon, 37 of Laurel Springs, has come a long way from pressing almonds at a fire station. A bottle of his cold-pressed Origin Almond juice now retails for $4.99 and is sold by 60 retailers nationwide, including Whole Foods and Mom’s Organic. 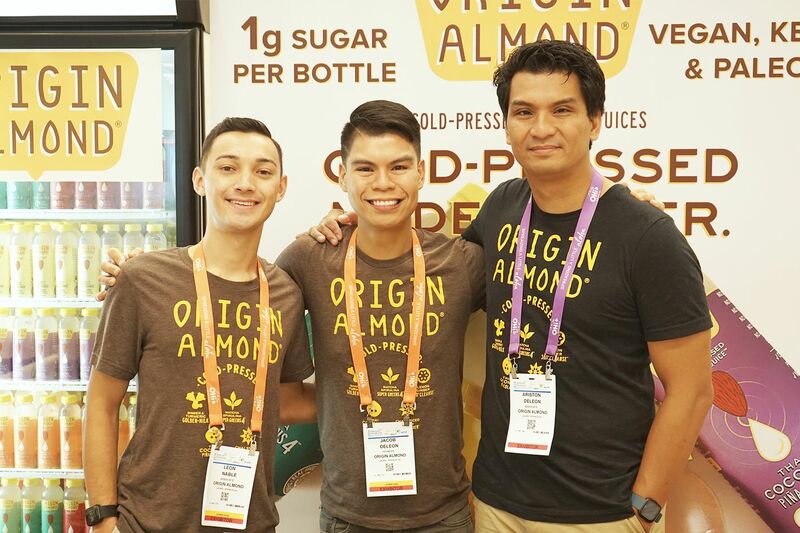 By his account, Origin Almond moves up to 5,000 units per month nationwide, with sales totaling around $300,000 in 2018. Jake Deleon said the company expects to increase sales by 500 percent this year. Last month, Origin Almond was one of five companies selected out of 200 by food giant Kraft Heinz to participate in the second class of its Springboard Incubator. The Chicago-based program, which ends on June 26, provides mentorship, training, and access to investors, among other perks. Origin Almond on the shelf of a Wynnewood, Pa. Whole Foods. Since the bottles hit the shelves of supermarkets in 2016, the original formula has been tinkered with to create a distinct sweet, tangy, and mildly-spicy flavor, as described by a handful of Inquirer staffers who taste-tested the beverage. Jake Deleon said that the high sugar content in some of his favorite beverages prodded him to create an alternative. Nutritionally, Origin Almond is solid, according to Philadelphia nutritionist Olena Zinshtein. The almond juices range from 90 to 120 calories and one to four grams of sugar per 12-ounce bottle. She appreciates the variety of flavors (such as Thai Coconut Piña Colada and Super Green) and the wholeness of the ingredients. “I like that sprouted almonds are used in the product, which increases bioavailability,” the rate at which a substance is absorbed into the body, Zinshtein said. Almonds are considered “sprouted” when the nuts have been allowed to germinate and are more easily digested. Aside from nutritional value, Origin Almond’s next biggest asset is timing, said Wayne W. Williams, assistant professor at Temple University’s Fox School of Business. Williams said the rising demand for almonds helps enlarge production and lowers wholesale prices, making it more accessible for companies that depend on the nut as the main ingredient. The popularity of health food, particularly almonds, has risen in recent years, according to a research study by the Agricultural Marketing Research Center. In the United States, “nut flours are expanding as an alternative to regular wheat flours in the gluten-free market. ... The non-dairy alternative market of almond milk is expanding, offering a low-fat, high-protein option for consumers." Williams said that to remain viable, the company should be agile enough to respond to shifts in consumer preference. “If the market shifts to mangoes, they should be able to pivot. Not becoming too niche is a blind spot for most entrepreneurs,” Williams said. Even Kraft Heinz has recently had to face difficult questions for selling too much junk food in a health-driven food market. Some analysts criticize Kraft Heinz for products that are too processed and for not innovating enough. Partnering with Origin Almond could help remedy this. What’s next for the upstart? Jake Deleon, founder of Origin Almond, speaking at an industry event in 2018. At the Kraft Heinz incubator, Deleon starts his day with a 5 a.m. workout and is then swept into meetings with marketing teams and potential investors. He also still has to run his own business remotely, by checking in with his team of 15 people (who include part-timers, brand ambassadors, and contractors), tracking orders and email correspondence. Networking with Bob Gillespie, executive director at Second Century Ventures, has been one of the most rewarding parts of the incubator for Deleon. Companies founded by Gillespie have gone on to raise over $60 million in venture funding with an enterprise value of over $150 million, according to Gillespie’s LinkedIn account. His parents are Philippine immigrants who moved to the U.S. in 1984 when he was 18 months old. Since then, Carmelita said, she’s done her best to instill a work ethic in her son. That’s why she put on her apron and hair net to help him press almonds during the early stages of his business. Piña Colada is her favorite flavor, followed by Ginger and Turmeric Golden-Mylk.